It has become a critical truism in recent years to suggest that the most successful animated films appeal both to adults as well as children. Hasn’t this always been the case? Since Mickey Mouse appeared in Walt Disney’s debut short, Steamboat Willie (1928), Max Fleishman’s Popeye (from the comic strip created by EC Segar) and George Herriman’s Krazy Kat, cartoons have often had a cross-generational appeal tapping into our common need to laugh, indulge flights of fancy and escape into narratives that have the flow of dreams. 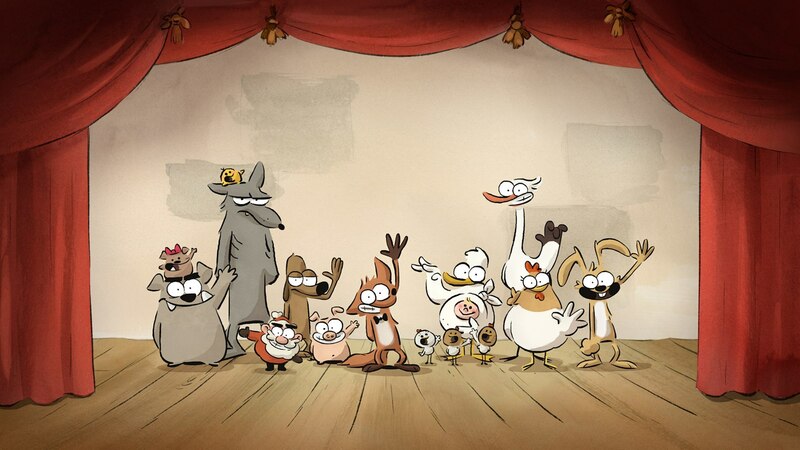 The Big Bad Fox and Other Tales is a Franco-Russian co-production that has done healthy business on the continent since last autumn and has now been redubbed with British actors for the English language market. The artwork is simple, but not bland, recalling a slightly streamlined Quentin Blake. Opening as a Noises-Off type stage play on the verge of collapse, the farmyard animals act out three stories. The first “A Baby to Deliver” deals with the chaotic, but earnest efforts of a pig, rabbit and duck to deliver a baby, abandoned by an injured stork, to its parents in Avignon. The second tale, “The Big Bad Fox”, deals with the brave efforts of the pig to prevent the fox from eating 3 newborn chicks. The chicks soon mistake the pig for their mother which heightens the comedy. The third and final tale, “We Must Save Christmas”, reunites the pig with the rabbit and duck from the first tale as they help to deliver presents when they mistakenly believe they killed Santa. All three tales involve misunderstandings of one kind or another and elaborate efforts to restore order, which are continually frustrated by the good intentions or over-zealousness of one of the animals. While there is nothing in any of these tales to disturb the calm of even the most nervous child, there is plenty of energy and invention throughout these deceptively simple tales. The dialogue is also sufficiently scripted to give the various animals distinct personalities. The pig just wants to be left alone to enjoy gardening, but gets caught up in the manic schemes of the rabbit and duck. The farm dog is a slacker jobsworth. The fox is an old softy at heart, while the mother hen is probably the only character who combines common sense and kindness to rise above the anarchy that seems endemic to the farm. The Big Bad Fox and Other Tales has been sensitively adapted to the English market thanks to the voices of Celia Imrie (mother hen), Adrian Edmondson (rabbit), Phil Juputis (dog), Bill Bailey (duck), Justin Edwards (pig) and Matthew Goode (fox) so that the bucolic French setting seems as universal as a village in the Home Counties or a ranch in the American southwest. Briskly paced and full of droll sight gags, directors Benjamin Renner and Patrick Imbert, make seemingly familiar characters their own and the result is a gentle, but not sickly sweet visual foray into rural wonderland where anything can happen, but all’s well in the end.